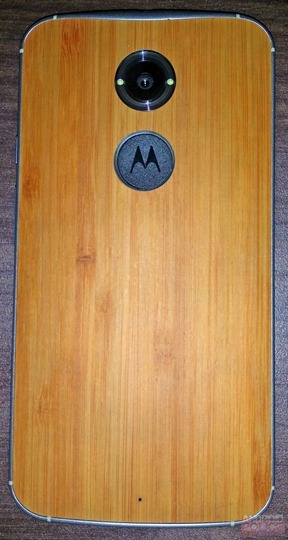 We've been hearing rumors and seeing at least some evidence of a new Motorola flagship for the past few months. The Moto X was released in August of last year, which makes it just about time for a refresh in the current yearly phone cycle. 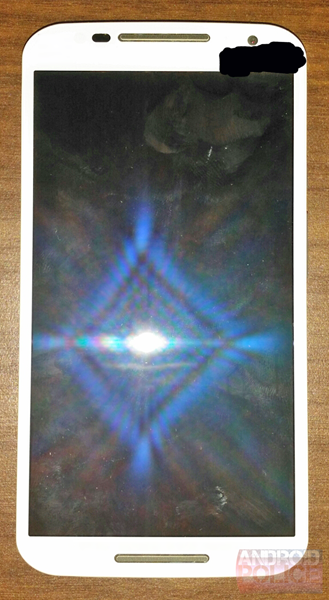 Recently a tipster sent us a series of photos, claiming that the device is a "near-final prototype" from Motorola. The source claims that what you're looking at is the Moto X+1, and based on the evidence, it seems reasonably legitimate. 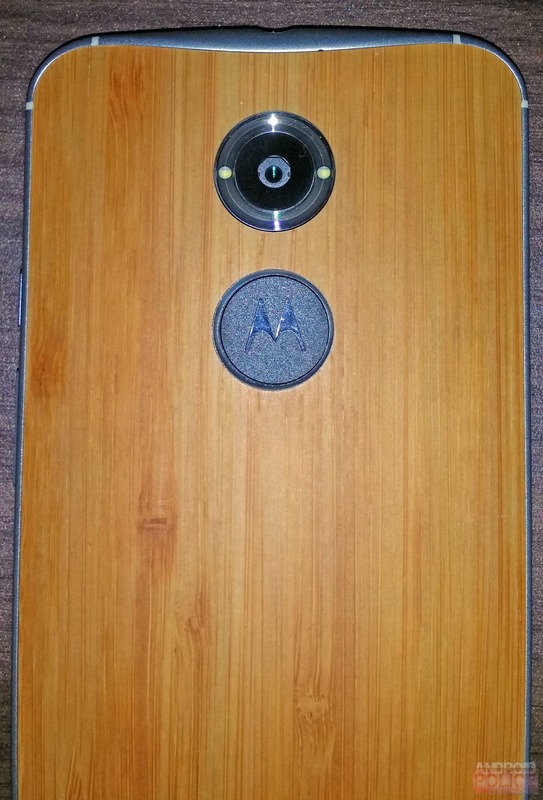 The photos show a device that's very similar to the current Moto X in shape and layout, complete with the signature customized wood back. The tipster says that the silver-colored segmented ring around the phone's sides is made of aluminum, not unlike the HTC One family, though the metal build doesn't extend to the front or back. 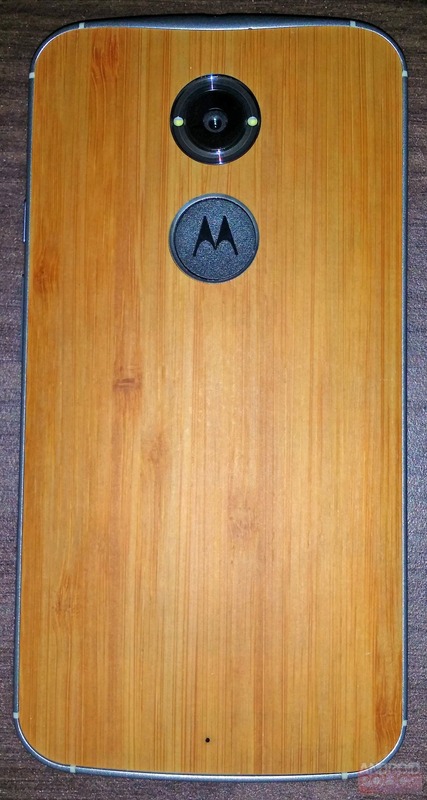 The phone is claimed to have a 5.1-inch screen (the Moto X is 4.7") with no capacitive buttons, which roughly matches various reports, along with a loudspeaker beneath the screen and opposite the earpiece in the style of the Moto E. The back has a Motorola logo set into the wood in what appears to be plastic, which differs from the wood backs on the Moto X. The two white dots on either side of the circular camera module are claimed to be dual LED flashes. Like the Moto X, there is no MicroSD card slot. The rest of the phone is typical of Motorola's current design language, including the right-side controls and the top-mounted headphone jack. 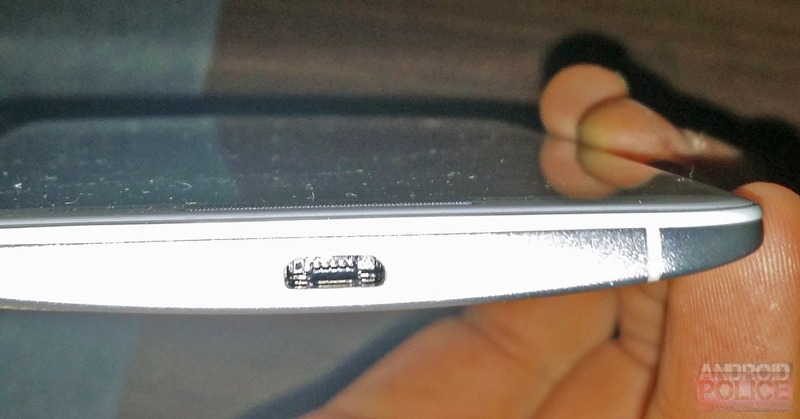 Note that the SIM card slot has been shifted to the top of the device. Our tipster says that the non-removable back will also have custom leather options in blue and purple, with other colors a strong possibility. Other colors, not in leather, are white and black. Evleaks previously reported a list of possible rear cover options in wood, leather, and presumably plastic. Other unconfirmed reports claim that the X+1 will use a 1080p screen, a Snapdragon 800 processor, 2GB of RAM, 32GB of standard storage, a 2900mAh battery, and 12MP/5MP cameras on the back and front, respectively. That report leaked from a Brazilian retailer and also mentioned a MicroSD card slot, so its accuracy relative to this leak may not be 100%. Given that Motorola eventually released the Moto X on all four of the major US carriers, plus Canada, some European countries, India, and Brazil, it's a safe bet that they intend to make the next flagship release count. Considering the timing of this leak, it's unlikely that Motorola's new parent company Lenovo had any real input on the device's core design. Without accessing the device itself, and without seeing it power on, there's no way to be 100% certain that this is real. That said, it's a compelling leak, and at this point it's more likely than not that this is the genuine article. We have no timeframe for a release date or price, but various sources have claimed that Motorola intends to release the Moto X+1 and the Android Wear-powered Moto 360 simultaneously.